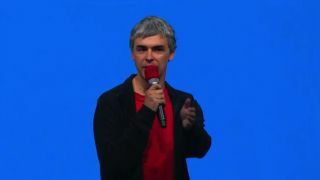 Google CEO Larry Page staged the final act of the marathon Google IO keynote today, a 3-plus hour barrage of music, the Galaxy S4 with a Nexus twist and Maps news. While he stayed fairly high level in discussing how humans should use (and not have to think) about the technology in their lives during his prepared remarks, it was after an audience question that he threw barbs at the industry for not progressing as quickly as it should by focusing on "negative and zero-sum games." One culprit in particular: Microsoft. "I've been quite sad at the industry's behavior around [open web standards]," he said. "If you take something as simple as instant messaging, we've had an offer forever that we'll interoperate on instant messaging. "Just this week, Microsoft took advantage of that by interoperating with us, but not doing the reverse, which is really sad. We need interoperation, not just people milking off one company for their own benefit. Google has always stood for that." "It's ironic that Larry is lending his voice to the discussion of interoperability considering his company's decision [on May 15] to file a cease and desist order to remove the YouTube app from Windows Phone, let alone the recent decision to make it more difficult for our customers to connect their Gmail accounts to their Windows experience." Page, who yesterday revealed he's endured vocal chord paralysis for the past 14 years, admitted that while Google tried to stay "on the right side of things," the company is practical in terms of not "shooting ourselves and our users in the foot." "I'm sad that the web is probably not advancing as fast as it should be," he continued in his response to the query, posed by a Mozilla employee. "We've certainly struggled with people like Microsoft. We've had a great relationship with Mozilla I think, and value that deeply. I'd like to see more open standards and [companies] get behind things that just work." Even though Android has seen a surge in adoption, Page said he doesn't think developers should have to decide which system they will create software for. "In the long term, developers shouldn't have to think about, 'Am I developing for this platform or another,'" he said. "I think you should be able to work at a much higher level. The software you write should be able to run everywhere easily." Page's comments were perhaps the most rousing part of an otherwise anti-climatic keynote. Though developers are sure to jump on services like Android Studio, the lack of major hardware announcements and demonstrations that have defined conferences' past left a rather empty aftertaste from an end-user perspective. Granted, this is the foundation for the groundbreaking announcement's of next year's (or the year after's) IO. Perhaps if Page's hope for a free-experimentation, Burning Man-type safe spots - a wish he expressed during the unorthodox Q&A - will bring out such earth shaking developments.